When the rules of the game change what the defenders of the status quo think doesn't matter as much as what customers do. 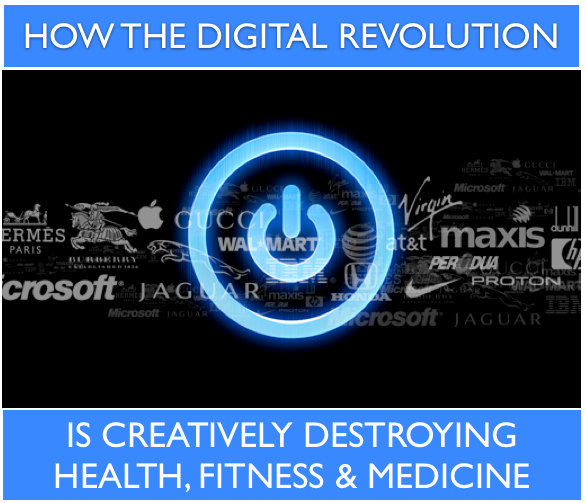 This is how disruption happens and is why the present state of health and fitness, even of medicine in general, is about to shift: radically. Just look back at the music industry during the past decade, enough said. Think that comparison isn't relevant ? Think again. Originally derived from Marxist economic theory, of all things, and later popularized by Joseph Schumpeter, Creative Destruction is the description of a "process of industrial mutation that incessantly revolutionizes the economic structure from within, incessantly destroying the old one, incessantly creating a new one." As with the fitness industry where extant participants are slow to adopt, changing consumers, particularly ones more open to technological tools, are going to drive adoption whether the industry likes it or not. This will create great opportunities for some and extinction for others. So what do you think ? 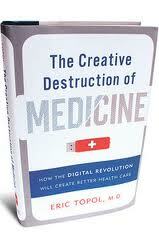 Do you agree with Dr. Tobol's thinking and do you believe it relevant to both the medical and fitness industries ? Please contact me Bryan O'Rourke and share your views. I'd love to hear from you. Bryan O’Rourke is a health club industry expert, technologist, financier, and shareholder and executive in several fitness companies. He consults with numerous global brands, serves as a member of the GGFA Think Tank, is Chair of the Medical Fitness Association’s Education Committee and a partner in the Flywheel Group. To learn more contact Bryan here today .